BRANCH OUT: Creative Events for ALL Teens! Join us for an Open Art Studio as well as Apple Crisp making! Free apps. Branch Out is a FREE event for all Teens! Come learn more about Printmaking! Branch Out is a FREE event for all Teens! Holiday gift-making workshops & Gingerbread houses! 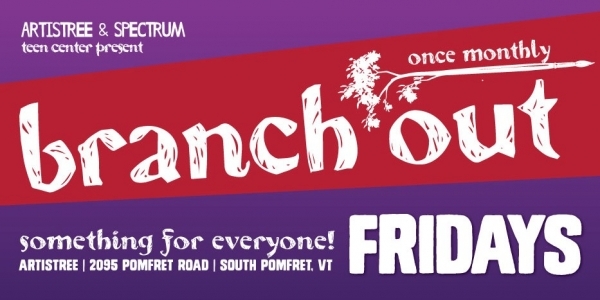 Branch Out is a FREE event for all Teens! Help us glaze for the Empty Bowls Project! Free Soup & Bread Branch Out is a FREE event for all Teens! Branch Out is a FREE event for all Teens! Come to ArtisTree on Branch Out nights for Free Food and the Arts! December 14: Holiday Gift Making Workshops 6-9pm - Complete! Branch Out Teen Nights are for all teens grades 7-12 and include themed activities planned by teens! Branch Out is FREE to all teens!